These savory muffins are made with yogurt, olive oil, and whole wheat flour, and filled with bacon, Parmesan and spring onions. Perfect for a quick breakfast or a light afternoon snack. Preheat oven to 390°F / 200°C. Line a muffin tray with paper cases. Make sure the bacon has cooled enough so it does not melt the parmesan cheese. In a small bowl, combine all the ingredients together. Set aside. In a medium bowl, mix together the yogurt, milk, and oil until smooth. Whisk in the egg and beat until smooth. In a separate medium bowl, mix together the dry ingredients. Slowly fold the dry mixture into the egg mixture. Fold until the mixture is just mixed, being careful not to over mix. The mixture may be a little lumpy, but as long as there are no large pockets of flour it is okay. Carefully fold in the filling, reserving about 2 tablespoons worth to place on top of the muffins. Spoon the muffin mixture into the muffin tray, filling each muffin about 3/4 full. Place the reserved filling on top of each muffin, and slightly press the filling into the dough. Bake the muffins for about 25 minutes, until they are golden brown. Remove the muffins from the oven, and sprinkle on additional Parmesan cheese on the muffins as garnish. Return the muffins to the oven for an additional 2 minutes, until the Parmesan is melted. These muffins are best served warm and on the day of baking. However, the muffins can be kept in an airtight container in the refrigerator overnight. Warm them up in the microwave or oven again before serving. Recipe adapted slight from The Ginger & White Cookbook. 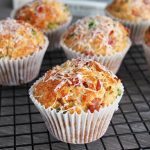 Get this recipe for Savory Muffins with Parmesan, Bacon and Spring Onions at https://www.theworktop.com/breakfast-brunch-recipes/savory-muffins-parmesan-bacon-and-spring-onions/.